Those feeling a bit windswept by the weather these days may do well to head over to the NYABF at the Park Avenue Armory and peek into Abby Schoolman’s exhibit at booth A32, where she’s highlighting some exciting contemporary art books and bindings. 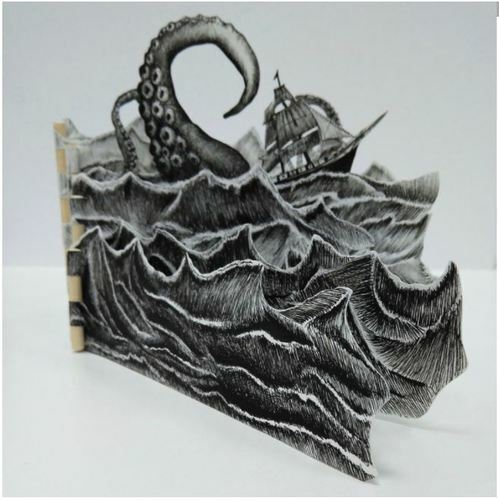 In addition to her stable of works by the likes of Mark Cockram and Tim Ely, Schoolman is introducing her latest Instagram find,The Kraken by thirty-year-old Spanish paper artist Carla Busquets. This one-of-a-kind book includes eight original drawings rendered in black ink on four folios mounted on five wooden dowels.The piano hinge structure is based on innovations by book artist Hedi Kyle and the piece is signed by the artist on the back of the last leaf. “I mostly work with paper,” Busquet explains in Schoolman’s catalog. “I love the versatility of the material, how easy it is to manipulate and also the skill required to turn it into delicate work.” She also looks to the natural world for inspiration, and in The Kraken, Busquet looked to the massive, fearsome sea creature of the deep that was believed to capsize seagoing vessels since the time of Odysseus. In this rendering, the kraken’s massive tentacles churn the black waves, ominously approaching a doomed schooner. Formerly a conservator in the UK, Canada, and Spain, Busquets opened her own studio, la Frivé, last year where she hosts workshops for paper artists of all ages in addition to practicing her craft. Bonus: this kraken won’t swamp your book-buying budget, nicely priced at $500. If you’ve got time and energy to spare after rummaging through the NYABF’s wares, head down to Pier 36 where the annual Art on Paper show focuses on contemporary art.